Hop on one of the many Hop-On Hop-Off sightseeing buses and enjoy the ride. On the busses you'll have the option to listen to the tour guide in English or an audio guide in English, French, Spanish, German, Italian, Portuguese, Mandarin, Russian, Japanese, Korean or Hebrew. 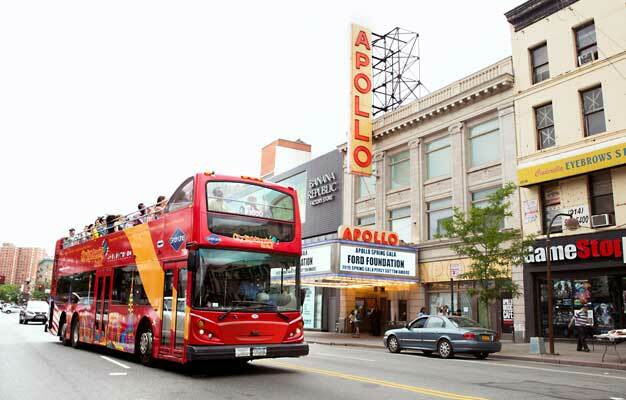 Shortly after your booking is complete your e-ticket will be sent directly to your email, just print it out and bring it to Gray Line CitySightseeing New York visitor center, where you'll exchange it for your tickets. Hop-On Hop-Off bus tickets are valid for 48 hours from the time the ticket is issued at the visitors center. Tickets for the New York Historical Society, the Museum of the city of New York and city sightseeing Hop-On Hop-Off ferry are valid as indicated on the ticket stub.